The jungle seems a tangle of vines and stalks and leaves. The only way you move through the impenetrable wall of green is with a machete. Hacking with the knife, you can slowly make some progress, but the work is exhausting. Finally, you seem to be reaching the jungle's edge. Only a few heavy vines block your way. You bring back the knife to swing at one, but your native guide stays your hand. "No sir! Do not touch that one! Go around! It is dangerous!" You scoff at him. "Go around? What for? We're almost out. It's just a vine!" "Sir, you should have listened!" A strange tale, but could it be true? Is there flora that traps animals and consumes meat? Are there really man-eating plants? The atrocious cannibal tree, that had been so inert and dead, came to sudden savage life. The slender delicate palpi, with the fury of starved serpents, quivered a moment over her head, then as if instinct with demoniac intelligence fastened upon her in sudden coils round and round her neck and arms; then while her awful screams and yet more awful laughter rose wildly to be instantly strangled down again into a gurgling moan, the tendrils one after another, like great green serpents, with brutal energy and infernal rapidity, rose, retracted themselves, and wrapped her about in fold after fold, ever tightening with cruel swiftness and savage tenacity of anacondas fastening upon their prey. Though the story is colorful, research has shown the Liche's recitation was completely fabricated. There was no killer tree that grew in Madagascar, no Mkodo tribe, and apparently Carl Liche himself never really existed. Well, the former is certainly true. There are many plants in the world that eat meat. The great biologist, Charles Darwin, was fascinated by them and spent fifteen years of his life studying them. All plants, unlike animals, are capable of producing their own food. They take carbon dioxide out of the air, water from the ground, light from the sun and make food through a process called photosynthesis. In addition to sunlight, carbon dioxide and water, the plants also need certain minerals to survive. These they usually take out of the soil though their roots. Plants living in wet areas, such as bogs, have a problem, though. The water in these areas carry away many of the nutrients the plants need to grow. Some plants have found a solution to this problem by becoming carnivorous, which means "meat-eating." Rather than get the minerals they need from the soil, they trap animals, mostly insects, and take the nutrients out of the unfortunate victim's body. Darwin originally called these flora insectivores. Later scientists decided that the plants ate enough animals (other than insects) that the term carnivore should be used. Meat-eating plants use several different mechanisms to trap their prey. Pitcher plants have leaves that grow into a vase-like container with a hood that overhangs the opening. The edge of the hood is covered with a sweet-smelling nectar that attracts insects. Inside this lid are downward-pointing hairs that lead the insects further into the plant and slippery wax surfaces that are difficult for the victims to crawl on. At the bottom of the vase-like structure is a pool of chemicals that will digest insects if they fall in. Various versions of the plants use different methods to get the victims into their pools. For example, the yellow trumpet has a substance in its nectar that paralyzes any insect that eats it. Once the victim takes a sip, he soon tumbles into the pool and is digested. Other plants, like the sundew, use nectar to get insects to land on a leaf covered with sensitive hairs. Each hair has a tiny bead of sticky liquid on top. When the insect lands, it sticks to the hairs it is touching. As the victim struggles, other hairs bend over and attach themselves to secure the meal even further. The sticky liquid soon enters the insect's breathing holes and it suffocates. Digestive juices soon follow and the sticky liquid and the soft parts of the victim's body are soon dissolved away to be recovered and used by the plant. Perhaps the strangest and most well-known carnivorous plant is the Venus flytrap. The flytrap, whose scientific name is Dionaea muscipula ("mousetrap of Venus") looks like a small circle of strange leaves sitting close to the ground. Sometimes it is topped by a long stem with small white flowers. These plants are so strange that folklore has it that they come from outer space and only grow near the sites of meteor impact craters. The truth is that the flytrap comes not from the second planet from the sun, but from North and South Carolina. Its strange leaves have a lob at the end that looks like a small, green clamshell with teeth. Inside the clam shell are two sensitive hairs. If an insect lands on the lob and touches both of the hairs, or touches one of the hairs twice in a short amount of time, the trap is sprung. The two sides of the clamshell leaf close quickly on the insect. The "teeth" intermesh, making sure the animal cannot escape. After the trap closes, glands on the inner surfaces of the shell release digestive juices. Are any of these carnivorous plants capable of posing a threat to humans? Not really. The largest of the meat-eating plants is a relative of the pitcher plant named Nepenthes. It grows in the rain forests of Southeast Asia as a vine up to 50 feet in length. The pitchers sometimes grow to be a foot in length. Nepenthes traps mostly insects and small frogs, though animals as large as a rat have been found dead digesting in its juices. Some Nepenthes pitchers that have been found are large enough to hold four quarts of liquid. The Nepenthes is not a threat to humans, however. In fact the local people have found ways to make them useful. The pitchers can be cleaned out and used to cook rice, while its long, strong vines serve as ropes. If no carnivorous plant known is large enough to consume a human, where did the idea of man-eating plants come from? The plant responsible for starting these rumors might be Amorphophallus titanum otherwise known as the "corpse flower." Amorphophallus titanum, which is said to be the biggest, smelliest flower in the world, looks like something that could eat a human being. When it blooms it can reach at height over nine feet in height and smells like a mixture of rotting flesh and excrement. The pungent odor attracts bees which are trapped in the flower until they are covered with pollen. Then they are released to fertilize other plants. The Amorphophallus titanum, or "Corpse Flower" has been known to grow as high as nine feet. A blooming Amorphophallus titanum's "flower" (actually it is technically a leaf or spathe) can be three feet across. It is notoriously difficult to get a titanum to bloom outside of its native Indonesia, and botanical gardens around the world often try for decades without success. Bloomings of the Amorphophallus titanum have happened only about a dozen times in the United States since the first success at the New York Botanical Gardens in 1937. When the plant does bloom it moves quickly. It can grow as fast as 4 inches per day. The period when the "flower" is open lasts only about two days. 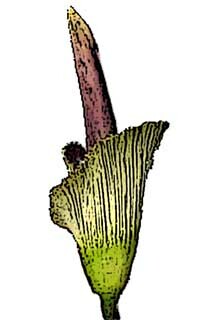 Although the Amorphophallus titanum looks a lot like you would imagine a man-eating plant to look like, and it even smells like somebody is dead inside, it is not carnivorous. Ironically, people are a lot more dangerous to carnivorous plants than the plants are to people. The pitcher plant and the venus flytrap live in wetland areas which are being destroyed by human development. Also the popularity of these plants is also working against them. Commercial plant collectors have stripped areas of the venus flytrap in an effort to provide them to consumers. Also many species of North American pitchers, whose leaves are in demand by florists, have been so decimated by collectors that they may disappear from the wild completely. Meat-Eating Plants by D.M. Souza, Franklin Watts, 2002. Carnivorous Plants by Tony Camilleri, Kangaroo Press, 1998.